The website, NassauStopBullying.org, includes a section on cyberbullying and explains state law that protects students who are bullied. 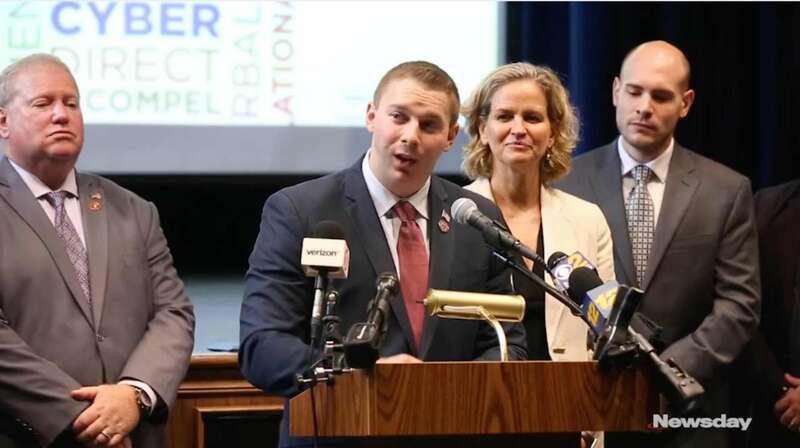 Nassau County Executive Laura Curran and Police Commissioner Patrick Ryder on Wednesday unveiled the county's new website to alert families and educators about the warning signs of bullying and students' rights if they are victims. The website, NassauStopBullying.org, was developed through the county's police and health and human services departments. It was the key element of a bill Curran signed into law in July. "Bullying, unfortunately, is nothing new. But we can change how we handle it, how we respond," Curran said. "By standing up, by getting informed, by getting the outreach from this website, we can make it so we are not bullies ourselves." The website includes a section on cyberbullying and an explainer of the state's Dignity for All Students Act, also known as DASA or the Dignity Act, which was signed into law by former Gov. David A. Paterson and implemented in the schools in 2012. Under the law, "no student shall be subjected to harassment or discrimination by employees or students on school property or at a school function." School staff must attend regular training and offices designate a staff member responsible for reporting DASA violations. The website contains a list of the DASA coordinators in Nassau's schools. Nassau Legis. Josh Lafazan, an independent from Woodbury who caucuses with Democrats, introduced the bill that helped launch the website in June. Lafazan is a former member of the Syosset school board. "We are emboldened by the prospects this site brings to forge a kinder and more gentle society," Lafazan said. "And we are taking a major leap forward in Nassau County — arm in arm with elected officials and police and students and parents alike — to say enough is enough, and that no child, no where, no how should be made to feel anything less than their true value."